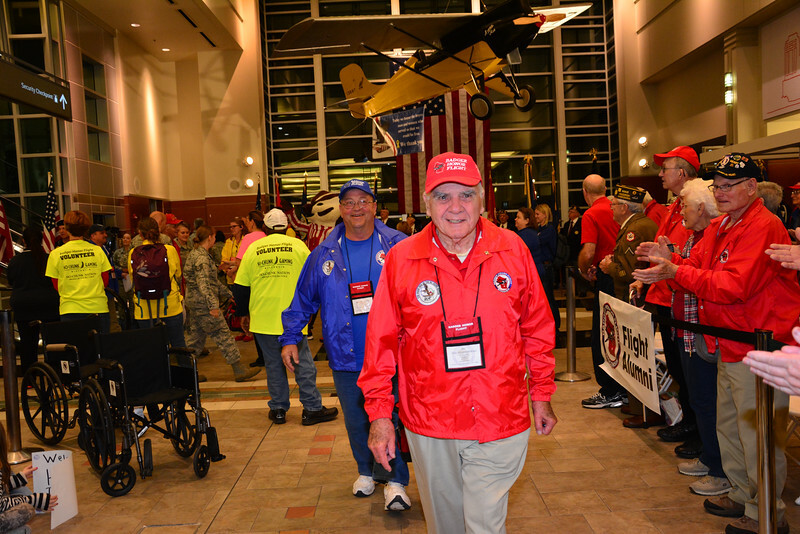 October 10, 2015 Badger Honor Flight. Major Alton A. “Ike” Eichelkraut, peacefully passed away on Sunday, December 3, 2017 at the young age of 93 at the William S. Middleton VA Memorial Hospital in Madison, WI. He was born on November 5, 1924 in Paoli, the son of Alfred and Alva (Becker) Eichelkraut. He was raised on the family dairy farm. Alton attended Paoli Graded School and graduated from Verona High School in 1942. He was the first captain of Verona’s first high school football team. On May 15, 1949 Alton entered into the United States Air Force and proudly served as a pilot and engineer for twenty years attaining the rank of Major, and earning a Bachelor’s Degree in Aeromechanical Engineering and a Master’s Degree in Astronautical Engineering from the USAF Institute of Technology. While in the Air Force he worked as a Propulsion Officer on the Titan Missile Program and Vietnamese Transport Advisor. After his service with the Air Force Alton worked as an Engineer with Lockheed Martin in Denver, CO. On February 15, 1952 he was united in marriage to the love of his life, Frances Johnson at Richmond, VA. Ike and Fran enjoyed traveling throughout the United States. Ike also enjoyed bowling, fishing, and golfing (even attaining a hole-in-one). Alton is survived by his wife Frances Eichelkraut, sons Kurt and John Eichelkraut, grandchildren Erica (Jay) Eichelkraut Zilbauer, Justin and Alec Eichelkraut, and great-grandchildren, Arli and Verona Zilbauer. He is further survived by a brother Harold (Rachel) Eichelkraut, nieces, and nephews. He was preceded in death by his parents and a sister, Charlene Schmid and brother-in-law, Delmar Schmid. A gathering of relatives and friends will be held from 6:00 p.m. to 8:00 p.m. on Thursday, December 7, 2017 at the Becker-Beal Funeral Home, 109 Greenway Cross, Belleville, WI. A prayer service led by Rev. Laura Crow will conclude the gathering at the funeral home at 7:45 p.m. on Thursday. Burial services with full military honors will be held at 1:00 p.m. on Friday, December 8, 2017 at the Southern Wisconsin Veterans Memorial Cemetery, 21731 Spring St., Union Grove, WI. Memorials can be made to “Wounded Warriors”. Heading Down the Parade Route Dane County Regional Airport.